There were a high concentration of total solar eclipse paths in the delta region, with 9 out of the 28 eclipses occurring there. This suggests references to them might be found in that area, especially in the vicinity of Busiris, Hermopolis, and Pharbaithos. That area had more total eclipse paths crossing it than in any other location. This list does not include every eclipse that was visible to the Rama ni Kuma. There are many types of eclipses that were visible: Annular, Partial, Central Annular, Central Total, Non-central Annular, Non-central Total, Annular-total, besides the Total eclipses listed here. This list is small and does not have a statistical purpose. However, by directing our attention to these regions and dates it can aid in the interpretation of existing materials connected to eclipses. With certainty the Rama ni Kuma were great observers of the sky who were acquainted with planetary and stellar cycles in the pre-dynastic era (See the April 2, 1998 issue of Nature Magazine, Megaliths and Neolithic astronomy in southern Egypt). Recent discoveries of sites revealed ceremonial complexes that consisted of megalithic alignments and stone circles at the Nabta Playa depression in the Sahara. Those complexes indicate the Rama ni Kuma could have been familiar with Sun/Moon phases enough to know about eclipse cycles. How they were regarded is not known at this time. Speculation for this lack of documentation has ranged from an eclipse being such an upset to the goddess Maat’s order that it was unmentionable, to the relative rarity of eclipses as the reason for their absence in Rama ni Kuma records. One possible answer for the lack of historical records is that the Rama ni Kuma recorded much of their documents on papyrus, which actually kept well in the desert areas. However, papyrus did not keep as well near the damp Nile region where many total solar eclipses occurred. In contrast to the clay tablets of the Babylonians, papyrus was the more vulnerable to decay. Certainly, they had words for eclipse: tnw, and nshn, with variations such as: iaH nshn - Lunar Eclipse, and nshni-wr - Great Eclipse. nshn is written with a Set-like character for its determinative . This same word also means Storm, Terror, Rage, and Disaster. As another example there is the phrase "a m tA pt pA itn"-"The sky swallows the Sun Disk". There are also references to eclipses that can be found in spells, such as a "Let not the sun-disk grow dark....let not the sky swallow the moon". Concerning the influence of a lunar eclipse, a high priest Osorkon said, "Though the sky had not swallowed the Moon, there was a great turmoil in the country. ", an indication that a lunar eclipse was believed to have disruptive effects. Simply, total solar eclipses occur at the New Moon when the Sun and Moon have the same declination, and lunar eclipses occur at the Full Moon when the Sun and Moon have opposite declinations. The beginning of the Rama ni Kuma month was at the first invisibility of the lunar crescent, and was called psDntyw. psDntyw fell near the New Moon, which would put a total solar eclipse on or near an important calendar day. Likewise with a lunar eclipse, as the Full Moon was an important feast day. This would add to the significance of their appearance. Partial and annular eclipses are certainly visible to the naked eye, and do inspire wonder. Total solar eclipses are the primary focus here as there is no eclipse as remarkable as a total solar eclipse. With its alteration of the daylight and the manner in which it charges the air, it certainly would have been noticed. One can actually see a wave of darkness as a total eclipse path travels across the land. This is the shadow of the Moon as it comes between the Sun and the Earth. The phase of maximum totality lasts up to 7.5 minutes, averaging around 4 minutes, often lasting less than a minute. The whole process from the beginning partial phase to maximum totality, to the last phase of the eclipse may last over two hours. Those brief minutes of maximum totality would have had a powerful effect on a people who held the Sun and stellar events in the regard that the Rama ni Kuma did. There were 28 total solar eclipses whose paths crossed the Nile River in Kemet during the period from 2837 BC to 493 BC. Solar eclipses usually have a lunar eclipse following or preceding it. This would result in a pair of eclipses within 15 days of each other. These total solar eclipses had 10 lunar eclipses that were visible in Kemet. The visibility of a lunar eclipse is not confined to a path as with a total solar eclipse, and can be seen wherever the Moon is visible at the time of the eclipse’s occurrence. The following list provides regions and dates where some form of documentation for these total solar eclipses might have been written. The Northernmost and Southernmost cities mark the boundaries of the total eclipse paths, with the Northernmost city listed first. The coordinates for those cities are written in blue. Total solar eclipses that were accompanied by a lunar eclipse that was visible in Kemet are indicated with a /,with their dates in brackets. All of these lunar eclipses were partial. The dates for the total solar eclipses and their paths were taken from Solar Eclipses of the Ancient Near East, by M. Kudlek and E.H. Mickler. Their dates and approximate paths were confirmed by The Canon of Solar Eclipses, by J. Meeus and H. Mucke. Those dates were also confirmed by Solar Fire 4.07, a software program developed by Esoteric Technologies, Inc. For the lunar eclipses, calculations from Lunar Eclipses of the Ancient Near East by M. Kudlek and E. H. Mickler and Solar Fire 4.07 were used. There are two cases where the lunar eclipse dates from these two sources differ, and they are marked by /*. For eclipse #11, L.E.A.N.E. gives March1, as the date, while S.F.4.07 gives February 29. For eclipse # 15, L.E.A.N.E. has the eclipse occurring before midnight on the 16th of May, while S.F.4.07 has it occurring after midnight on the 17th of May. Both of those differences are reasonable. In the first case a leap year day is merely given a different date on the calendar. In the second case the differences between mathematical tables and various software computations are bound to disagree slightly, owing to the uncertainty in fluctuations of the Moon and the Earth's rotation rates. This can lead to different results for the locations and timing of eclipses for ancient dates. 1.November 24, 493 BC. From Iunyt (Latopolis) 25N18 32E33 to South of Elephantine24N05 32E53. 2.December 4, 502 BC /[November 19]. A narrow path from Abedju (Abydos) 26N11 31E55 to Iunyt 25N18 32E55 . 3.March 28, 517 BC /[April 13]. From Abedju 26N11 31E55 through Cusae 27N26 30E49. 4.September 21, 582 BC. From Ankh-tawy (Memphis) 29N51 31E15 to Teudji (Ankyronon Polis) 28N48 30E55. 5. August 19, 636 BC. From Antaeopolis 26N54 31E31to El-Mo’alla 25N28 32E31. 6.August 15, 831BC. From The Mediterranean to just North of Ankh-Tawy 29N51 31E15. 7.January 27, 932 BC. A narrow path from Cusae (Qis) 27N26 30E49 to Ipu (Panopolis) 26N34 31E45. 8.May 22, 948 BC / [June 5]. 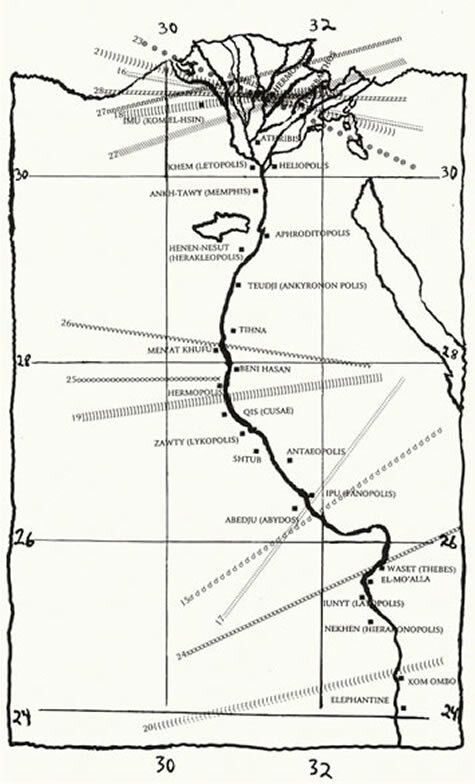 Between Antaeopolis 26N54 31E31 and Iunyt 25N18 32E55. 9.May 31, 957 BC. Between Ipu 26N34 31E45 and South of Elephantine 24N05 32E53. 10.July 31, 1063 BC. A very narrow path that ran through Waset (Thebes) 25N42 32E38. 11.February 14, 1129 BC. /*[February 29-March 1]A very narrow path that ran through Henen-Nesut (Herakleopolis) 29N05 30E56. 12.August 19, 1157 BC. Across the Northern Delta region, between Busiris 30N55 31E14 to Athribis 30N28 31E11. 13.July 27, 1258 BC. Within Ipu 26N34 31E45to El-Mo’Alla 25N28 32E31. 14.May 14, 1338 BC. From Aphroditopolis 29N25 31E15 to Shtub 27N09 31E14. 15.June 1, 1478 BC /*[May 17]. -This is the Solar Fire 4.07 date.Between Zawty (Lykopolis) 27N11 31E10 and Nekhen (Hierakonopolis)25N05 32E47. 16.May 9, 1533 BC. From just below the North Eastern Delta region coast to Ankh-Tawy 29N51 31E15. 17.April 16, 1699 BC. /[March 31]A narrow path heading Southwest across Abedju 26N11 31E55. 18.December 21, 1741 BC./[January 6, 1740 BC]This narrow path entered the Delta region near Imu (Kom el-Hsin) 30N48 30E36, moving East to Tanis 30N59 31E53and Pharbaithos, 30N44 31E37 where it ended. 19.September 15, 1884 BC. From Men’At Khufu 28N06 30E45 to Zawty 27N11 31E10. 20.April 20, 2044 BC. A very narrow path that ran through Kom Ombo 24N28 32E57. 21.September 11, 2079 BC. From the Mediterranean coast to just North of Heliopolis 30N08 31E18. 22.June 29, 2159 BC. From the Mediterranean coast to just North of Ankh-Tawy 29N51 31E15. 23.December 20, 2289 BC. /[December 5]The Northern two thirds of the Delta region. 24.March 23, 2340 BC. From Abedju 26N11 31E55 to Iunyt 25N18 32E55. 25.July 25, 2430 BC. Not very wide, this path’s totality phase ended on the Nile at Hermopolis 27N47 30E48. 26.September 2, 2469 BC. A narrow path, from Tihna 28N11 30E47 to Beni Hasan 27N56 30E53. 27.April 1, 2471 BC. /[April 16] From the Mediterranean to just South of Ankh-Tawy 29N51 31E15. 28.November 19, 2837 BC. 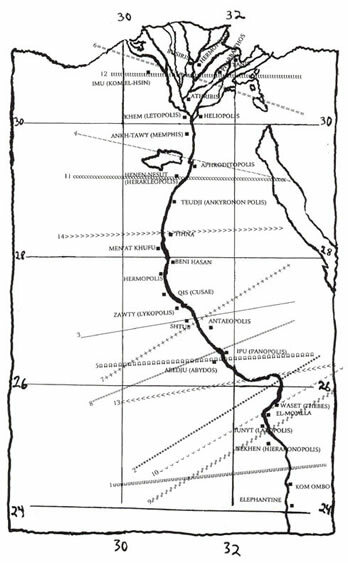 /[December 4]From the Mediterranean coast to a line stretching from Heliopolis 30N18 31E18 through Khem (Letopolis)30N08 31E08.